The West Georgia Wolves came into University Stadium Saturday afternoon ranked #2 in the nation, and proved why they belong there with a dominating 57-27 win over the Fayetteville State Broncos. The 57 points the Wolves put up was a University Stadium record, and quite a few Wolves contributed to the 593 total yards on offense. West Georgia’s offense showed its balance yet again Saturday, with 303 yards on the ground and 290 in the air. Those 303 rushing yards were put up even without a 100-yard rusher, a first for the Wolves this year. They also doubled the Broncos time of possession. UWG used a trio of running backs throughout the game: redshirt freshman Aares McCall, freshman Devontae Jackson, and senior Derick Seward. Devontae led the three with 85 yards, and backup quarterback Will Garret put up 79 yards on the ground as well. Dallas Dickey was phenomenal yet again, his 15-of-21, four touchdown performance earned him the Gulf South Conference offensive player of the week. All four of his touchdowns were to different receivers, showing the depth the Wolves have on offense this year. Fayetteville State opened up the game with the ball, and in no time were on the board with a 37-yard touchdown pass to Chris Hubert. Chris made an excellent play on the corner and finished the play off with a one-handed grab for six. Unfortunately for Chris and the Broncos, this was their only points the entire first half. UWG went three-and-out on their first drive, and then the #5 ranked defense came up big a few drives later. Alex Armah came around the edge and forced a fumble by the quarterback. Quenton Brown scooped it up for the Wolves with 2:46 left in the 1st quarter. Dickey and the offense could not capitalize on the excellent field position, and were forced to punt yet again. The defense then forced the Broncos to another punt, in which the special teams units for the Wolves came up big as they have so often in the past. 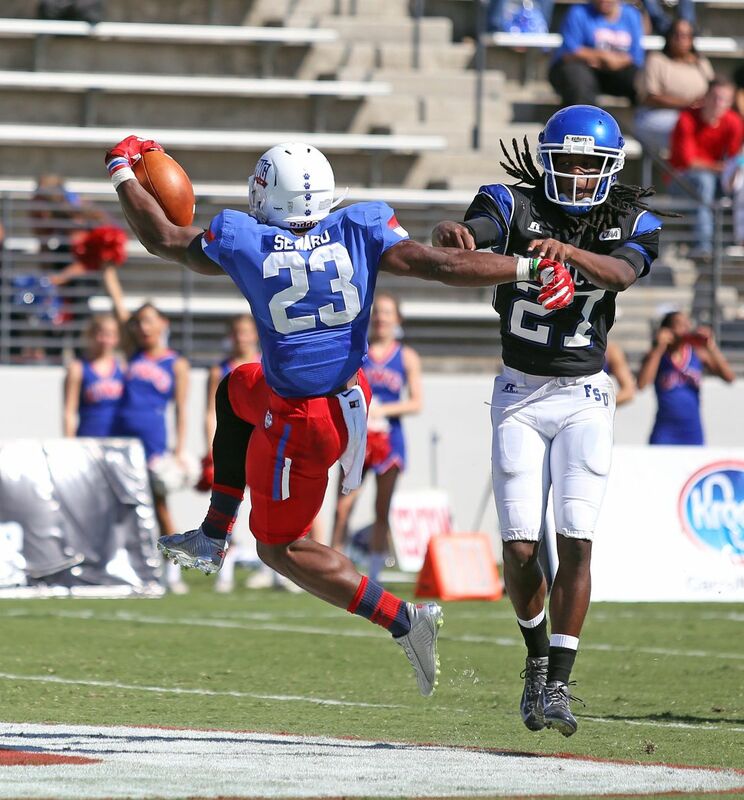 Marcus Sayles blocked the punt, giving UWG the ball at the FSU five yard line, their best field position of the game. 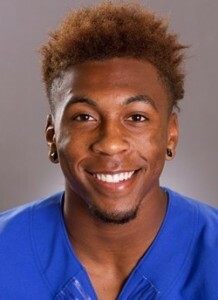 Will Garrett then took the field rather than Dallas Dickey, a move by Coach Hall that may have come to a surprise to many UWG fans in attendance. Two plays later, the move made by Will Hall proved to be smart, as Will Garrett took it in for short touchdown. The two point conversion was then converted, also by the legs of Will Garrett, giving UWG the 8-7 lead with 13:22 left in the second quarter. West Georgia’s defense then came out and forced another Bronco three-and-out. Five plays later, Dallas Dickey escaped what looked like a sure sack and hit a wide open JaNardian Jones on the run for a 47 yard touchdown. Hunter Heck converted the PAT, giving the Wolves a 15-7 lead with 10:29 left in the half. The offense was getting plenty of chances in the first half as the defense hardly gave up anything after the first drive. 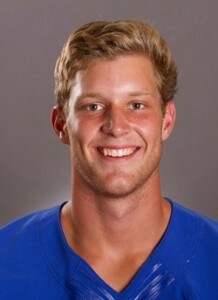 Dickey engineered a 10-play, 72 yard drive in the middle of the second quarter. This drive took 4:21 off the clock and was capped off by a touchdown from Dickey to senior Shaq Hall. After another successful PAT, the Wolves lead 22-7. 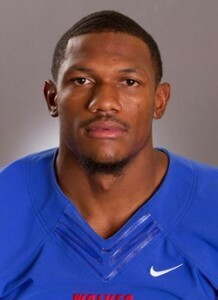 The punting team of the Fayetteville State Broncos saw more action Saturday than they probably have all year. As the half came to an end, true freshman De’Rell Freeman returned a FSU punt 33 yards to Fayetteville’s 49 yard line. The offense acted quickly, and found pay dirt one last time before the half ended, this time from a nine-yard fade to the corner of the end zone. Sophomore Qa Walker made a marvelous leaping grab over the defender to give Dickey his third passing touchdown of the half. This touchdown gave them a 29-7 lead going into halftime. UWG’s 29 point second quarter outing was a school record, and was definitely an experience to witness. UWG received the opening kick of the second half and took the ball 90 yards in just 10 plays. The drive was finished off by Dickey’s fourth passing touchdown of the day, this one was a 31 yarder to redshirt freshman Aares McCall. The next Bronco possession led to another punt, in which Marcus Sayles got his second block of the day. His performance earned him Gulf South Conference special teams player of the week, and gave UWG magnificent field position twice. This time, it took the Wolves just three plays to get into the end zone. Derick Seward ran it in from three yards out, giving him his first score of the day with 8:42 left in the third quarter. The Broncos finally found the end zone again on a 29-yard pass the ensuing possession. This made the score 43-14 late in the third. Derick Seward finds the end zone for one of his three scores in UWG’s 57-27 win over Fayetteville State Saturday. The fourth quarter started with another Derick Seward touchdown, this time from 10 yards out. His second score of the day made the score 50-14. Seward found pay dirt one last time with 7:25 to go in the contest, giving him a total of 3 touchdowns on the day. The Broncos would add two more touchdowns as the game came to a close with a final score of 57-27. 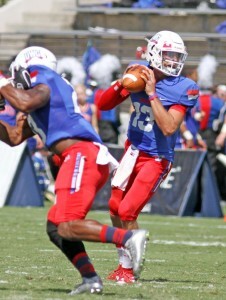 It seems Coach Hall has been using Will Garrett as a more dual threat quarterback. Almost every time he took the field in the first half at the QB position, it was a designed draw. He would take the field on crucial moments in the first half, for example on the goal line and on fourth down. As I mentioned last week, Garrett is getting plenty of useful playing experience in these first three games, and has looked outstanding in those outings. Saturday, Garrett went a perfect 7-of-7 for 97 yards. The UWG defense was nothing short of perfect in the first half after the first drive. The defense forced 7 punts in the game, and forced two fumbles. It was led by senior linebacker Marion Chapman with 6 tackles, followed by Chris Harthorne with 5 stops to go along with one sack. For the third week in a row, the West Georgia defense was spectacular on third down. This week, they only allowed 1 of 9 attempts to be successful. West Georgia returns home this Saturday for the third week in a row where they will take on Clark Atlanta for Homecoming. Kickoff is at 2 PM. Last year, the Wolves defeated the Panthers of Clark Atlanta 42-2. West Georgia fans can expect another big win Saturday against a struggling 0-3 Clark Atlanta team. These early season wins are great experience for the young Wolves of West Georgia as they will go on the road 2 of the next three weeks after Saturday, facing teams that are all currently ranked nationally as well as undefeated. October will be no easy task for Will Hall’s Wolves as they travel to West Alabama, Coach Hall’s previous school, October 3rd, come back home for Valdosta State the 10th, and then travel to Delta State the 17th. Not to mention the matchup against North Alabama the 24th, a team that defeated the Wolves last year 31-28 in a comeback victory.